Glasgow, Manchester, Essex and Edinburgh are the most popular destinations for dress hire this month at Girl Meets Dress so we’ve decided to take you through the best rentals for each. We start with our most popular city, Glasgow. What’s going on in Glasgow? Hosting events 7 nights a week from 11pm-3am, The Buff Club is a night out not to be missed. When it’s a night out with the girls you need to look the part with our fabulous party dresses to rent in Glasgow. Our Stella McCartney Pleated Stretch Dress is ideal for turning heads whilst our Alice and Olivia Bown Metallic Dress will flatter any figure. Don’t worry about any drink spillage on your night out either – we take care of all the dry cleaning! Number 16 is a cosy, friendly eatery in the heart of Glasgow’s west end. For such a quaint restaurant you’ll be needing to look exceptionally special – whether you’re renting an evening dress for a first date or dinner with the girls, Girl Meets Dress have got your Glasgow dresses covered. 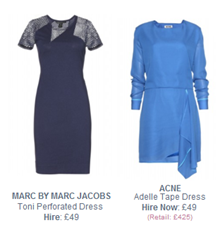 Look sleek in our Marc by Marc Jacobs Toni Perforated dress or add a splash of colour to your night with our Acne Adelle Tape dress. We’ve got lots of great cocktail dresses all available with next day delivery anywhere in the UK! Right in the heart of Glasgow is the Royal Concert Hall, famous for hosting spectacular nights featuring everything from orchestras to exhibitions. We have so many evening dresses for hire in Glasgow so you’re spoilt for choice – from our Nicole Miller Kate Lace dress to Carven Tweed Dress. We’ve even got some great evening maxi dresses to hire from a range of designers including Gorgeous Couture and Erdem. Known in the UK as one of the best nightclubs around, Tiger Tiger should be visited whenever you’re in Manchester. Boasting several different dance rooms and a restaurant, the club is guaranteed good night out. For a truly great party dress try the Halston Heritage red prom dress or our Nicole Miller evening dresses – remember, you can rent 3 at a time and get a refund on the ones you don’t wear! Double Michelin star holder Michael Caines has created arguably one of Manchester’s best restaurants. From truffles to a specially selected wine list (and champagne bar) this eatery is a truly exclusive night out. 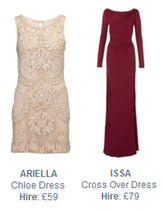 We’ve got some great ladies evening dress hires, including Ariella evening gowns and our Issa Crow Over Dress. Launched in 2000, the Comedy Store is situated in the heart of Manchester. A laughter-factory which is no stranger to big names, this theatre-style auditorium is a popular comedy venue amongst Mancuians. Perfect if you’re looking to do something a little different with your night. 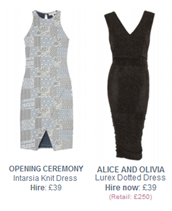 Ignore the Manchester dress shops and head over to Girl Meets Dress to rent some night out dresses like our Alice and Olivia Lurex Dotted Dress and our Opening Ceremony Intarsia Knit Dress. If you’re going out in Essex you know it’s got to be an amazing night. Evoke nightclub – who’s capacity is a massive 1100 – has had a £2.5 million redevelopment and is open four nights a week. It even has an ice bar! 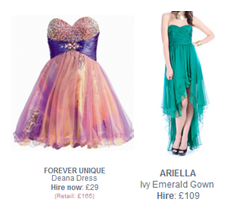 Dress the part with our party prom dresses to hire in Essex – try our Forever Unique Deana Dress or our Ariella Emerald Gown. Remember we’ll deliver the dress to you – at your home, at your office, wherever you want it! The Rare Cow – also known as “Home of Great Steak” – is a restaurant committed to providing the finest in British beef. With an unusual interior not often associated with steak houses (leather chairs and white walls) this restaurant will get meat lovers tongues wagging. 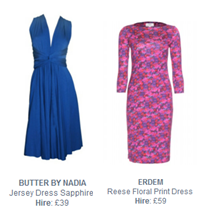 Hire evening gowns in Essex for your special night out – try our Erdem Reese Print Dress or our Butter by Nadia Sapphire Jersey Dress. This quaint theatre plays host to a range of performance genres including drama, comedy and musicals. The building, which is steeped in history, provides an intimate setting for some memorable shows. Hire an evening dress for your night out like our Alice and Olivia Lora Metallic Dress or Gorgeous Couture Cara Swarowski Dress. For over 17 years Liquid Room has been a leading venue for gigs and clubs in Edinburgh. Covering everything from Country to Dubstep and boasting names such as Dizzee Rascal and Calvin Harris, Liquid Room promises to be a good night out. 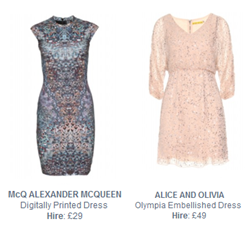 Hire a party prom dress in Edinburgh and be the envy of all your friends in our Alice and Olivia Olympia Embellished Dress or hire an evening dress like our McQ by Alexander McQueen Digitally Printed Dress. If you’re looking for traditionally Scottish dining then look no further. The Magnum, a short walk away from Edinburgh’s city centre, serves classic Scottish dishes alongside fresh seasonal game and seafood. 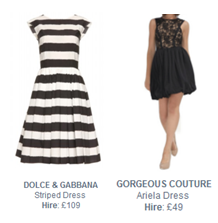 Hire evening dresses in Edinburgh and dazzled in our Dolce and Gabbana Striped Dress or stun in a LBD like our Gorgeous Couture Ariela Dress. We provide a pre-paid postage label for you to return the dress when you’ve worn it! Completely hassle free. Performing in Edinburgh Castle, the 2013 Tattoo features awe-inspiring variety from the four corners of the globe. It’s truly bagpipes-galore with a whole host of dancers and bands playing in kilts. Although a coat may be required (hopefully not raincoats) hire an evening dress and feel glamourous whilst you watch the Tattoo perform. 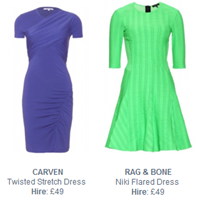 Hire our Carven Twisted Stretch Dress or our Rag & Bone Niki Flared Dress. Posted July 31st, 2013 in Features. Tagged: Acne, Alice and Olivia, ARIELLA, ARIELLA COUTURE, Butter by Nadia, carven, Dolce and Gabbana, dress hire in edinburgh, dress hire in essex, dress hire in glasgow, dress hire in manchester, Erdem, evening dresses to rent, forever unique, GMD loves, Gorgeous Couture, Halston Heritage, Hire evening dress, hire prom dress, Issa, Marc by Marc Jacobs, Mcq by Alexander Mcqueen, nicole miller, oplulence england, rag and bone, rent prom dress.